SocialVibe’s advertising platform exchanges premium services for lengthy, opt-in ads, and their impressive engagement rates have already caught the eye of global brands and presidential candidates. SocialVibe has ambitious plans to make much of the Internet completely free, from FarmVille credits and Internet Wi-Fi, to unlimited Pandora streaming. Their method is to offer users an otherwise paid service in exchange for lengthy, interactive advertisements. Consumers appreciate the brand for saving them cash, the brands finally get enough attention to display informative and creative ads, and service providers rake in more users for premium services. Thanks to extraordinarily high engagement rates, with the average users spending 63 seconds on an ad and 10-40% sharing it with their social network friends, SocialVibe has lassoed high-profile clients, from global brands and A-list celebrities, to presidential campaigns. “I love SocialVibe,” says Pepsi’s head of Digital Marketing, Shiv Sighn. “On the Internet, people have been really effective at completely ignoring banners,” says SocialVibe CEO and former President of EMI Jay Samit (who, incidentally, personally negotiated iTunes’ original music deal with Steve Jobs). 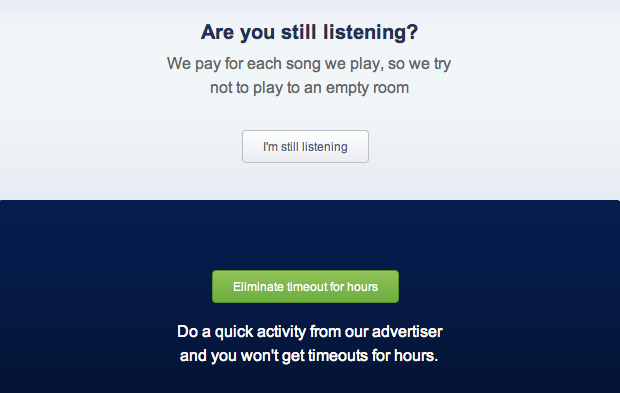 SocialVibe’s trick is to appear at the moment when users would otherwise be asked to shell out cash: A Zynga character needs energy, Pandora’s free listening quota has been reached, or a user needs to connect at an airport. SocialVibe ads exploit the pleasant surprise of a third option to wedge in a longer, more interactive ad. 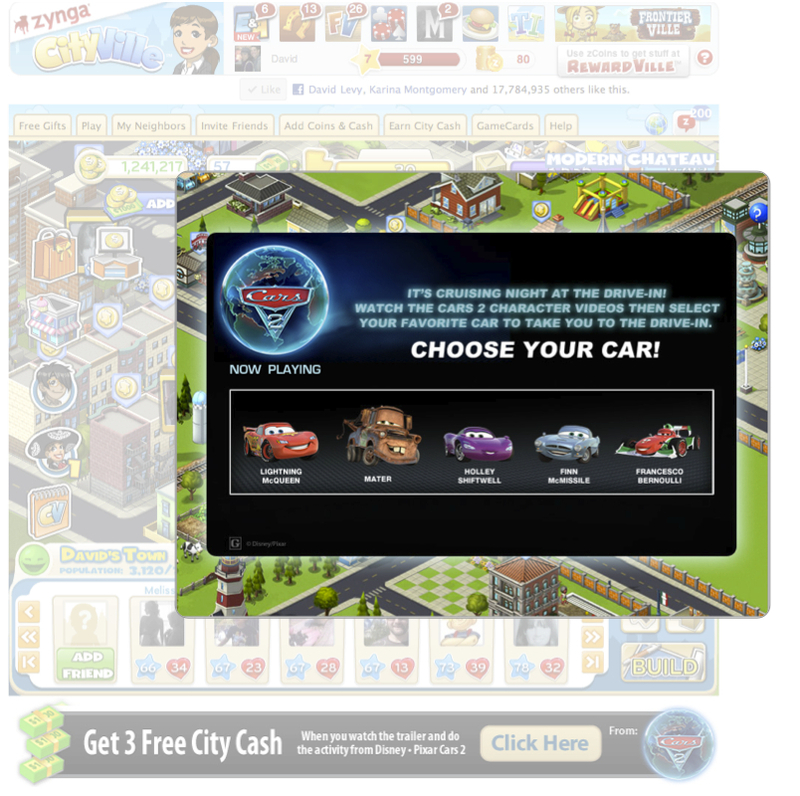 As an example, for Disney’s Cars, users were offered virtual currency inside Zynga’s popular CityVille game, for completing an ad that asked them to select a favorite character, displayed a tailored video, and then asked them to share their experience with friends over Twitter and Facebook. Results from KN Dimestore’s third-party return-on-investment evaluation of the Cars engagement are impressive: 7% more users who had played the engagement said that they had seen the movie in a follow-up survey two weeks later (32% of exposed users vs. 25% unexposed). SocialVibe’s engagement was even influential enough to push 3% more users into theaters who had previously said that they had no intention of seeing the movie. Given that few people see a family film alone, and that many of the users shared their enthusiasm with Facebook friends, the actually return on investment is likely higher than 7%, which is why advertisers are willing to spend enough money per ad to make premium services free. The impression-hungry 2012 political campaigns have already gotten wind of SocialVibe’s success and have begun experimenting in key battleground states. On average, users spend over a minute with each political ad, a whopping 85% complete the entire engagement, and 65% click through to the candidate’s website or issue page. “Many websites, many of the small content sites are absolutely dying because their business plan was based on a [cost per impression] rate that was unsustainable in a world of unlimited capacity,” says Samit. Advertising in the previous century, he contends, was based on a world of few television channels and limited magazine pages; the flood of Internet content washed away the scarcity model propping up high advertising rates, threatening the financial viability of many media industries, from news outlets to television (like Hulu). SocialVibe’s innovation is to leverage an abundance of information to create hyper-targeted ads, encourage sharing with social good and personalized content, and give freedom to consumers. As a result, SocialVibe makes brands look like heroes, swooping down in the nick of time to save users from spending their hard-earned money. “They think beyond the world of disruptive advertising,” says Singh, whereby the consumer can “appreciate the role that we’re playing.” In other words, Pepsi gets kudos for giving users free services. The alternative has been, thus far, to come up with flashy, attention-seeking ads that come between the user and their information. “Let’s pretend for a second that [flashy ads] did get them to click so you could get paid, does that really ingratiate you to the brand, by annoying your customer?” Samit asks, in an exasperated rant. While users may be reluctant to spam their network with advertisements, SocialVibe’s engagements typically include two elements that are more socially acceptable to share over Facebook and Twitter: individual expression and social good. Many ads provide elementary ways to remix videos, interact with characters, or promote a cause. 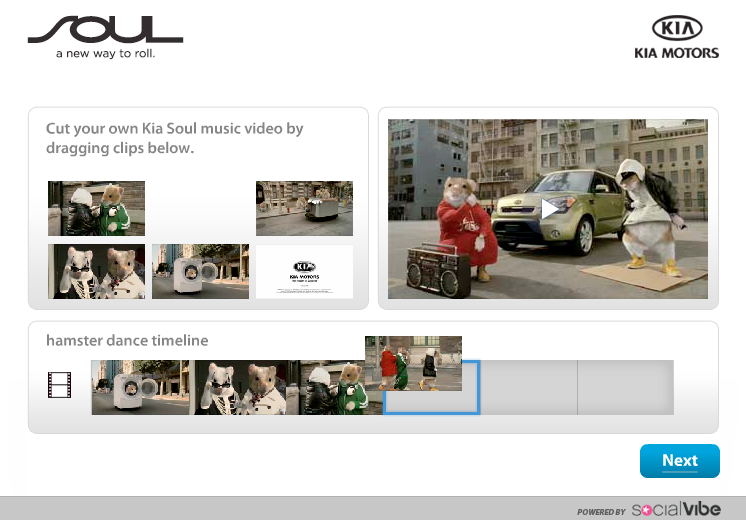 For the Kea Soul (pictured below), users splice their own music video together from a simple video editing engagement, and are encouraged to share their critter-filled creation with friends (play with the ad here). Like expression, sharing philanthropic causes with friends is more socially acceptable; SocialVibe ads often gives users the option of giving to charity, as opposed to, say, buying more virtual seeds for FarmVille. Indeed, originally, SocialVibe was exclusively a charitable marketing brand, but found that a for-profit model could dramatically increase their user base, and, ultimately, the slice of users giving to charity (like other brands we’ve profiled). The charitable bent has been a nice boost for Pepsi, whose Refresh campaign has bet big on social good advertising (try Pepsi’s engagement here, or check out the fully gallery of social good ads here).